Hello! I have been caring for kids since I first took a Safe Sitter babysitting course when I was 12 years old. I have experience caring for children of all ages, from newborn to teenagers. I am certified in First Aid/ CPR and have worked as a lifeguard and swim instructor for many years. 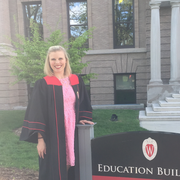 I graduated from UW- Madison last year as a K-12 certified Spanish teacher and currently teach middle schoolers in Milwaukee.